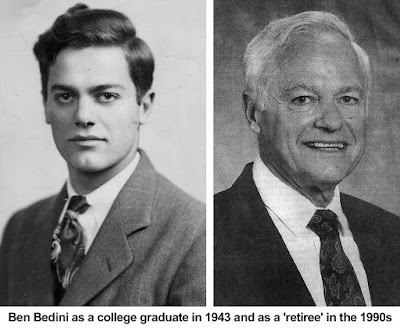 Ridgefield High School didn’t even offer football when Ben Bedini was a student in the late 1930s. Instead, the man who was to spend his life successfully leading others at football had to be happy playing only baseball and basketball. And he was a star at both, especially baseball. Americo Anthony “Ben” Bedini was born in Ridgefield in 1921. He attended local schools and was a member of the Class of 1939 at Ridgefield High School, where he often went by the nickname, “Kacker.” The ’39 baseball team was unusually talented, and wound up with a 15-2 record. It was undefeated in league play and won the league championship. Bedini went on to Springfield College where he graduated in 1943. He then served in the U.S. Army for three years. After his military service, Bedini taught and coached football at Housatonic Valley Regional High School in Falls Village, Conn., then at Rye (N.Y.) High School from 1954 to 1961. At Housatonic Valley, his football record was 26-1; at Rye he had 69 wins and five losses, with five undefeated seasons and six league championships. "It just was a very, very special time in my life, and I was lucky enough to coach a lot of great kids," Bedini said in a 1990s newspaper interview in Westchester County. His successes were noticed by nearby Iona College which was starting a club football team and offered him a coaching job. Over Iona’s first five seasons, his teams had a record of 25-9-1. His best year was 1967 when Iona had a perfect 9-0 record and a 20-6 televised bowl win over Kings College, which made Iona the 1967 National Club Football Champions. That season, Iona scored 270 points for an average of 30 per game, while giving up only 27 points, or three per game. The defense had five shutouts, a school record unbroken as of 2017. “He is considered by many to be the ‘Father of Football’ at Iona College,” the school says today. In a 2005 profile, The New York Times said, “Mr. Bedini's formula for success involved scouting and discipline, as well as then-rare strategies like changing plays at the line of scrimmage. He didn't swear — ‘cheese and crackers’ was his style of expletive, his wife noted — but he was tough. Switches smacked slow-moving legs. Chuck Hildner said he remembered practicing one day with his arms taped to his body — a lesson not to hold. In 1970 Bedini was named offensive coordinator for the Fordham University football team. Bedini, who held a master’s degree, also spent time as a full professor of physical education and director of athletics at Rockland Community College, a division of the State University of New York. When he was 60 years old in 1981, Bedini joined the Cleveland Browns as a college scout and training camp administrator. He stayed with the Browns until 1990 when head coach Marty Schottenheimer left to coach the Kansas City Chiefs. He asked Bedini to join him, and named him the Chiefs’ training camp administrator in 1991. By the late 1990s, he was “retired” and living in North Carolina where he was volunteering as an adviser to the North Carolina State football team. He proudly wore a ring commemorating that team’s 2003 victory over Notre Dame in the Gator Bowl. Over his long career, Bedini earned many honors include the 1955 New York Daily News Coach of the Year Award, and the 1966 National Football Club Coach of the Year Award. He was inducted into Iona’s Hall of Fame in 1990 and the Westchester County Hall of Fame in 1992. He was also honored by the Ridgefield Old Timers in 1996.